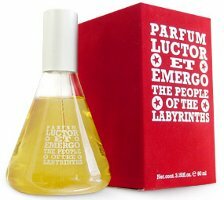 My vote in the "most calming fragrance" category is easy: Luctor et Emergo, released in 1998 by the funky Dutch design house The People of the Labyrinths (aka POTL), and included in Style magazine’s 2002 list of the top 5 cult perfumes. The notes are listed as fresh grasses, various white flowers, vanilla and precious woods. Luctor et Emergo starts as a slightly smoky, very resinous wood scent, with a touch of incense and a bit of grass or hay. The top notes are very soft and subtle. Over the next 30 minutes or so, it takes on hints of cherries and almonds, and slowly evolves into what is essentially a dead ringer for the smell of Play Doh. The Play Doh stage does not last long on me, but personally I enjoy it while it lasts. Who doesn't love Play Doh? As it fades, we are back to woods and resins with a light undertone of vanilla. Despite all the foody notes, it does not strike me as a gourmand fragrance — I would classify it as a woody-incense. I have been looking for the white flowers since I first tried this scent over a year ago, and have yet to detect a single one. Luctor et Emergo is a comforting, contemplative scent, and I find it rather addictive. It is the best scent I know of for reading in bed, so long as you don’t mind reading with your wrist glued to your nose. There is nothing particularly masculine or feminine about it. It is not cheap, but it is not the most expensive perfume on the planet either: about $165 for the Parfum (90 ml), and $110 for the Eau de Toilette. The Eau de Toilette is currently marked down to $79 at lacremebeauty. It has a bit less depth than the Parfum, but is otherwise fine, and I find the lasting power excellent in either concentration. For buying information, see the listing for The People of the Labyrinths under Perfume Houses. This is still my favorite perfume. It really is calming and takes you to a lovely place when things get stressful. I feel like Barbara Bui is similiar in that respect. I really can not wait for you to try it. I still have not gotten around to ordering my bottle but will soon. A, Got a decant of BB in the mail yesterday so will try it very soon! Previously I did get a couple of drops in a vial, but I only gave it a quick sniff as I wanted to send it on to Beth. I am surprised at how reasonably priced it is. Are you shopping today, or is it snowing? Hi Robin! I am taking our Annie to escape for the day! As for Luctor Et Emergo, I did cave after all the raving and clamoring on the MUA board. I am glad I got it and have enjoyed it but I do not think I will ever buy another bottle. There are just too many others that I love more. On the other hand, it is unique and worthy of all the raves. I can't say I find it calming, but when I wear it, I do feel happy! I'm eager to hear your comments on BBui! Oh, gosh, I have been trying to decide whether or not I like this fragrance for almost a year! I love your description of it, Robin; I think it is one of the most accurate ones I've read yet. I like POTL and it's interesting, but I find it difficult to persuade myself to buy a full bottle. Good, have a great day of shopping! I can't wait to hear what you guys find, your TJ Maxx finds make me very jealous. I have never bought a bottle either! A small decant has lasted me for over a year, as I almost never reach for it during the day, and a tiny drop at night is all I need. But if they ever put the Parfum on sale, I am sure to cave! POTL, well, I don't think it is my most calming perfume but its the most haunting. I have switched back and forth on this so many times. Sometimes I'm addicted, sometimes It just seems so-so. After decanting some awhile ago I couldn't stop sniffing the funnel I used. The funnel smelt amazing for days. Love that rich, warm spicy drydown. Curious, what do you think is most calming? While POTL is in my rotation for bedtime scents (along with Sage Onyx, Serge Lutens Rahat and Kiehl's Musk oil) I find that I don't reach for it very often otherwise. I'm not as enamoured of it as when I first purchased it. I'll use up my bottle, but I won't re-purchase. There are just too many other scents that I love more that are cheaper. I agree with you that POTL is unique and calming. The cachet of its cult status certainly adds to its allure. I have a rant for the edp bottle. It is so cheap for an expensive, designer fragrance! I understand why it is plain (since it's a unisex scent), but the quality of the materials is no better than inexpensive drugstore perfumes. It bugs me to no end! I have never seen the bottle in real life, that is a shame that it is not more impressive. I have a very hard time buying a perfume if I hate the bottle. I do wish they would sell a much smaller size, I would probably buy a 1.7 oz. As it is, I'll probably stick with decants. Hmmm…. Loved your detailed description, but I just don't get this one. Goodness knows, I've tried. I have several (3 or 4) vials – I keep reordering them from First-in-Fragrance, and swapped for them, thinking I've got a “bad sample”. I get nothing but a headache from POTL, and on paper, it looks like it's right up my alley. Maybe it's a skin chemistry issue. Not sure. Anyone else have this reaction? After 3 or 4 vials, I'd say it is time to give up! I know some people object to the play doh thing, and some people just find it boring. It is just as well not to like it — it is expensive stuff! I don't have a relaxing fragrance right now… I think my sinuses are acting up. But you know what? Reading about fragrances here, and on MUA is always relaxing for me! Unfortunately POTL doesn't really develop on me, it stays rather linear. I've sold off most of my bottle in decants, I rarely reach for it. For a pure comfort scent, I like Keiko Mecheri's Hanae. This one haunted me for a couple years. Did I hate it? Did I love it? I wasn’t sure, but I found I enjoyed wearing my sample to bed. A few samples later I finally bought a decant (hi Victoria- I’m sure that’s you!) and I’m so happy I did. I’m not sure I’d ever use up a whole bottle and I’m still wondering if I really love it, but one thing’s for sure: I still find it as haunting as ever. The perfume notes sounds really nice. I would love to buy a bottle but want to sample it first (the play-doh stage is scaring me , a lttle). Try first-in-fragrance.com in Germany; I think they ship worldwide and they do sell samples. Succulent wood, old libraries and jewelry boxes; makes me think of Nordic lodges, C.S. Lewis stories and old English Manors. This is one charmingly weird fragrance! I *love* Luctor et Emergo. And such an interesting and evocative name, the motto of the state of Zeeland. I never knew that scents could actually be addictive. I'm a newcomer here. For 20-25 years I wore one fragrance and one fragrance only, No. 1 by Laura Ashley. It's fine for someone in their 20s but maybe getting a bit cheeky for someone closing in on a statistically significant birthday. And then they discontinued it, anyway. I've been wearing Eau de Cartier for a bit, now, the clear stuff, not the blue. Then I stumbled upon this blog in my casting about on the web for something. And my goodness, what a concept, I can wear different perfumes on different days. And different perfumes in the morning and at night. And a perfume to read the Sunday paper and another to go roller-skating and another to mow the lawn. Cool! I've discovered the wonderful samples that you can get for peanuts, and have enough now so's I'm wondering how I keep them under control and find the one I'm looking for in the basket. I've been looking for racks for tiny test tubes in lab supply houses. What do you all do with those sample vials? It's a beautiful world, and life is good……. LOL, it is a beautiful world, isn't it? Always glad to meet another fan of POTL LE. If you come up with your own fabulous system, do come back and post, I am always looking for a better system myself. And by the way, if you do want something that will hold your vials upright, I know that some people use blocks of foam for that purpose — probably much cheaper than lab supply racks. Thanks, Robin. I read the comments from people, and the idea of finding a lovely piece of wood and drilling holes appeals for now. I can drill holes! I got a cordless power hole driller, hot-cha! I'm wearing this one right now- it's my first selection from a bunch of samples that I just received from Aedes. It's my very first niche perfume I've ever tried, and my first significant perfume- before I was a strictly Bath and Body Works girl, with some Britney Spears and a little Burberry thrown in once I started reading this blog. As for the actual smell I'm getting, it is a dead ringer for beeswax, in my opinion. Well, maybe not stright-up beeswax. All I know is that it smells exactly like my house at Easter when we're making Ukrainian eggs, using beeswax and the wooden what-cha-call-its to put the wax on the egg. Of course, I've only had it on for about 30 min., so I'm eagerly looking forward to the Playdoh stage, although my family might not be. Thanks for the great review though! Wow, your first niche perfume, how cool! Hope you got some other fun things to try, and hope you'll love at least one! I think I got 2-3 niche sample orders before I fell for something. Will add though, that some of my current favorites are things I tried and dismissed in those 1st few orders! I ended up really liking this one, despite my utter conviction that it smells just like beeswax- it is rather calming and it the kind of prefume I would wear while writing up a storm. I didn't really get much of a Play Doh smell from it, unless it was just slightly after wearing it for about 5 or 6 hours. It did, however, start to give me a bit of a headache because of it's good lasting power. I got several other perfumes I'm anxious to try. I've sniffed them all out of the bottle, but I'm reserving judgment until I actually try them. I think I'm trying Dyptique Do San today…I was excited to try Heeley Cardinal, but unfortunately, they were out of stock. They sent me Molinard Habanita instead. My first impression is one of getting hit in the face with a lemon-scented powder puff- not at all the danger/ intrigue I was expecting, but we'll see. Glad you ended up liking it, and hope you liked something else from your order! I'm currently working on a sample of this. For me, definitely a comfort scent. It makes me want to reach for a good book and a cup of cocoa. And an almond danish. Wow, now I want to spray on some POTL and curl up in bed. Wish I had some almond danish in the house! Yes, it triggers my appetite. And it beats craving tofu. I received my sample of this yesterday. I tried it last night – and it just smells like play doh on me, the whole time! It’s OK – i find it quite fun. But no way would I fork out for a bottle. In an odd sample-combo, I also received SL’s Rose de Nuit as well! I put that on the other arm. I hated it at first, and then about an horu later, it had morphed into a gorgeous, almost nutty, abstract rendering of rose that was quite delicious and captivating. I also wonder if that would layer well with Tauer’s Incense Extreme….time to start playing around and mixing it up…..!! Hey, $ saved! It isn’t a cheap scent, and I’ve lived on decants myself. Let me know how the SL + TP is! I didn’t love Rose de Nuit so much as the other SL, La Majeste de Rose (hope I have that name right). Just trying this. Peaceful and sweet with the odd overlay of Play Doh. Seems to fade rapidly. Perhaps not ideal on a hot muggy day. I just tried this today and, unfortunately, I hate it. It’s absolutely horrible…maybe just on me. I definitely get the play-doh comparison. And I pick up on the salty/cherry/almond aromas, but something about it makes me gag. It feels like someone is thumping that hangy-down thing in the back of my throat. I sat with my wrist up to my nose for at least a full minute to figure out what it was that made me so adverse to something so many other people seem to like. I finally concluded that it reminded me of the smell of the bottom of a used diaper bag. You know…the one you get free from the hospital, the cheapo vinyl/plastic thing. It smells like that plastic, with some lingering whifs of baby spit-up from old burp cloths , and some melted gummy bears stuck to the bottom. I was much more impressed with POTL A-Maze….not blown away but it’s a ton more tolerable (to me) than this.